When using a fireplace or wood stove for heat, you can, of course, cut and gather your own firewood. That not only requires a healthy amount of time, however, but also requires an initial investment of equipment like axes and saws and splitters. It also demands a working knowledge of cutting wood. You may need to acquire permits from the U.S. Forest Service or State agencies such as the California Department of Forestry and Fire Protection. Although there are a variety of measuring units, firewood is normally sold by the cord, or a fraction of a cord. The dimensions of a "standard cord" is a stack of wood piled 8 feet long, 4 feet wide and 4 feet high. You won't get a full 128 cubic feet of firewood with a standard cord because of the airspace between the pieces of the wood; the amount of wood in such a stack will depend upon the size and straightness of the pieces, how they are split and how the wood is stacked. Because of this, the total cubic feet in a cord can vary from 70 to 90 or more cubic feet. The cost of firewood varies according to the number of services a wood dealer furnishes -- tasks such as splitting, delivering and stacking. The cost also varies in different geographical areas. Orders for the purchase and delivery of firewood should be placed well in advance of the heating season. Wood purchased during the peak periods is in more demand and becomes more expensive. You will also want to purchase early to give the wood time to season. Seasoning takes place when the moisture content in wood reaches equilibrium with the moisture in the surrounding air. When wood is stacked outdoors with good air circulation in a spot that's dry, sunny and open for about six months it will be dry enough to support efficient combustion. Seasoned wood has a higher heating value than green wood. In general, because of its moisture content, a cord of green wood will weigh 70 to 100 percent more than seasoned wood. In either a wood stove or fireplace, the easiest and best fire is built by using a mixture of both softwoods -- from trees such as pines and firs -- and hardwoods -- oak, eucalyptus, cedar and so on. Softwoods start burning easily, and the hardwoods provide for long burning and good "coaling" qualities. A bed of ashes underneath the grate produces steady heat and aids in igniting new fuel as it is added. The fire will continue burning if small amounts of wood are added at regular intervals. 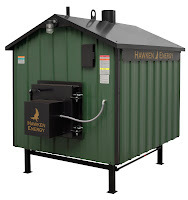 In fact, more efficient combustion results from burning small loads of wood with sufficient air than from burning large loads with minimal air. Below is the average energy content of various species of wood. * British thermal unit (Btu) values based on specific gravity of 80 cubic feet per cord. 8000 to 8500 Btu per pound for non resinous woods. 8600 to 9700 Btu per pound for resinous woods. Lower value of range assumes 70 cubic feet of wood per cord. Higher value of range assumes 90 cubic feet of wood per cord. Dry weight at 12 percent moisture content. Green weight at 40 to 60 percent moisture content. All moisture contents based on "wet" wood basis.